Ibuprofen, often sold under the brand names Advil and Motrin, is the most common human medication ingested by pets. The American Veterinary Medical Association says this is because the pills often have a sweet outer coating that appeals to pets. The drug can cause stomach ulcers and even kidney failure. Xanax (alprazolam) is a prescription sleep aid and antianxiety medication. Most pets that ingest the drug become sleepy and wobbly, and a few become very agitated. Large doses of alprazolam can cause blood pressure to drop and lead to weakness or collapse. Adderall is a combination of four amphetamines used to treat Attention Deficit Hyperactivity Disorder in children. The drug acts as a stimulant in pets, causing elevated heart rate and body temperature, hyperactivity, tremors and seizures. 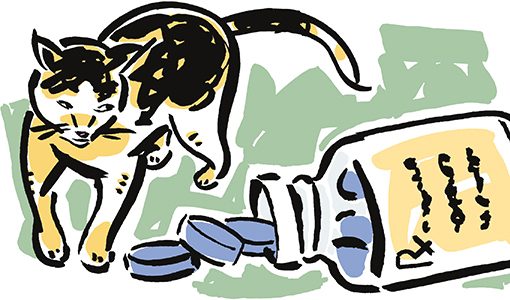 Tylenol (acetaminophen) is a particular hazard for cats, but it can also cause problems in dogs. The drug can damage the liver and red blood cells, which carry oxygen throughout the body. Aleve (naproxen), a common over-the-counter pain reliever, can cause stomach ulcers and kidney failure in animals, even in small amounts. If you suspect that your pet has ingested these or other drugs not prescribed for it, immediately call your veterinarian or the ASPCA’s 24/7 Animal Poison Control Center at 1.888.426.4435.